kenwood 9905 unit is pretty nice. also i am waiting for the release of the new Sony double Din with maestro in it as well. Not quite the same on the upgrade path... but has anyone on the 2015+ got an UPDATE to their HK headunit to get the new Android Auto functionality from the '19s? Had I known that'd be across the board in 2019 I'd have waited a few damn months to buy my WRX! There's no update for any older hu. I'm also still waiting for more info on the 19 hu with HK, but it seems no one has the need to open theirs up so far. In the 2019 HU thread its been said there is also a steering wheel control difference.. 15-18 had a menu and back button, while 2019 doesn't and that throws another obstacle to retrofitting. I have a 2016 FXT and loved everything about it with the exception of how the factory audio/navigation worked. I found it rather cantankerous when navigating from various menus to others or between functions and I absolutely HATED the inability to disable the turn-by-turn voice directions, which even when turned down as low as they would go were still very annoying due to the constant interruptions. So out with the old and in with the new. My prerequisites were that under no circumstances were any permanent modification to be made to the car, the sound stage I had as a result of the separate lows, mids and highs speakers and the H/K audio DSP couldn't be compromised, the installation had to appear as close to factory as possible and the radio had to have CarPlay. This meant no cutting or splicing any of the factory wiring, finding out a way to continue to utilize the H/K amp when it was receiving fader information over a twisted pair data connection and not via discrete front and rear input channels, and I needed to find something that occupied more dash real-estate than a standard double-DIN. So I spent the last couple of months piecing together everything needed for a seamless and non-invasive installation and I must say that I am very satisfied with the results. 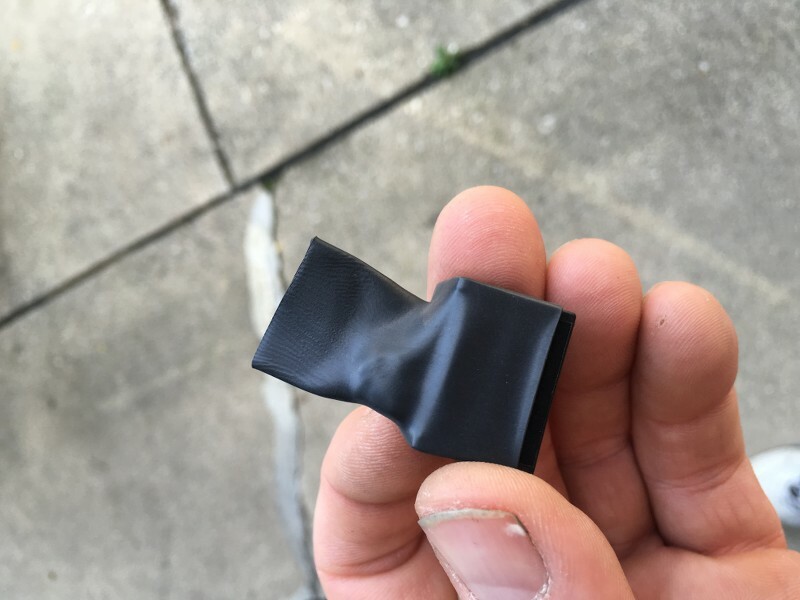 The factory 7" navigation radio had quite a few connections behind it but I stuck to my plan and made sure none of them had to cut off or spliced into. Anywhere I needed to manipulate the wiring, I did so with a compatible replacement mating connector. The head-unit I chose is the Kenwood DDX916WS. 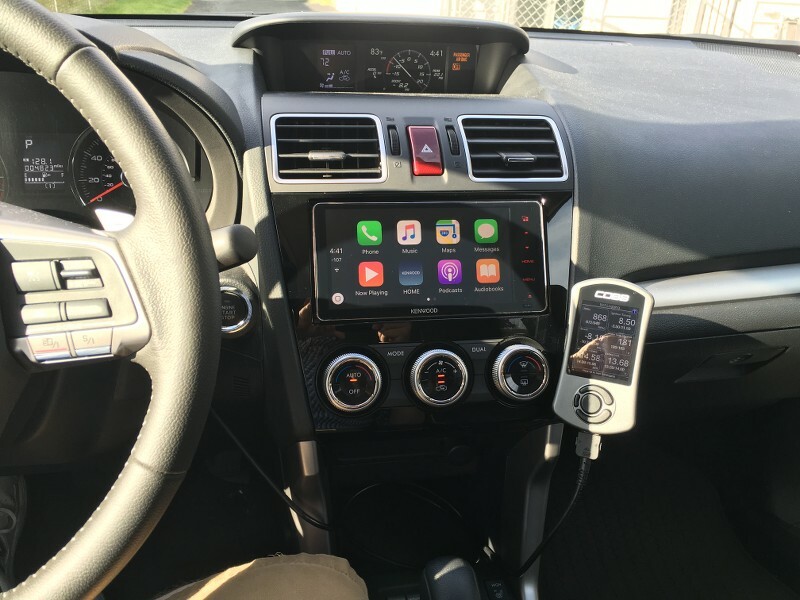 It's a 200mm Toyota replacement CarPlay radio that features a capacitive touch display, built-in steering wheel control interface, adjustable color illumination and the list goes on. It even comes with the plug-and-play wiring harness that works for those with the 10+6 Toyota style radio wiring. 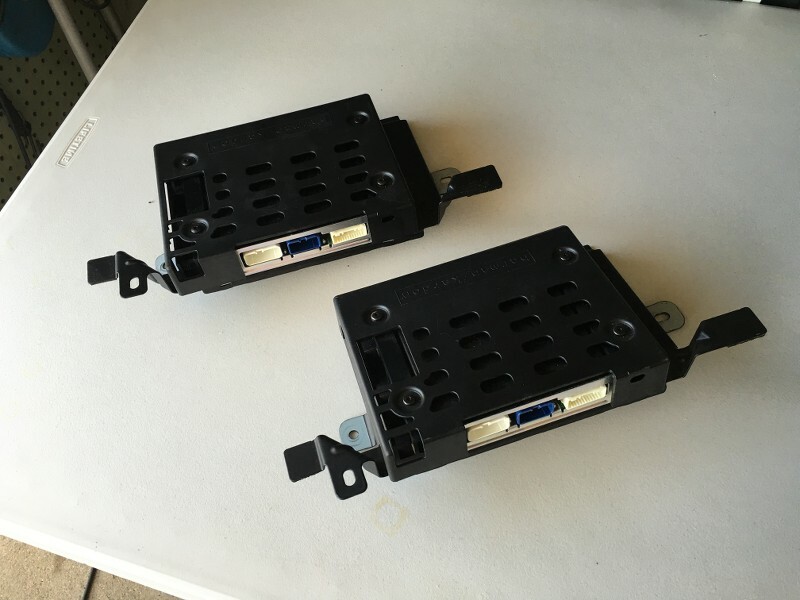 The 10 pin harness has the power, ground, illumination, antenna power, and front channel wiring and the 6-pin harness is for the rear channels. The wiring on the 10-pin would have worked fine if I didn't mind feeding a high-level signal into the amplifier. 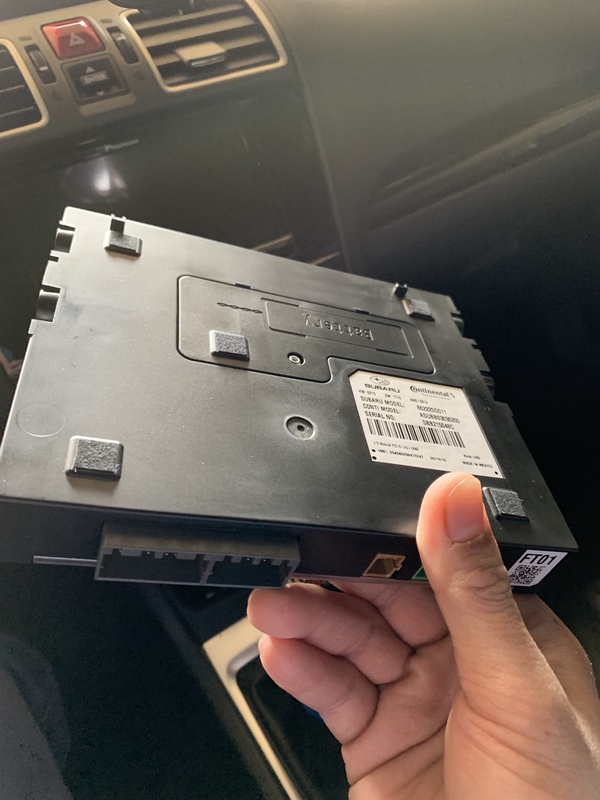 Problem was the rear channels are MIA from the 6-pin connector and instead, Subaru used that connector to provide part of the dimmer signal, the shielding for the audio going to the amp and the interrupt wiring which wasn't going to be used. 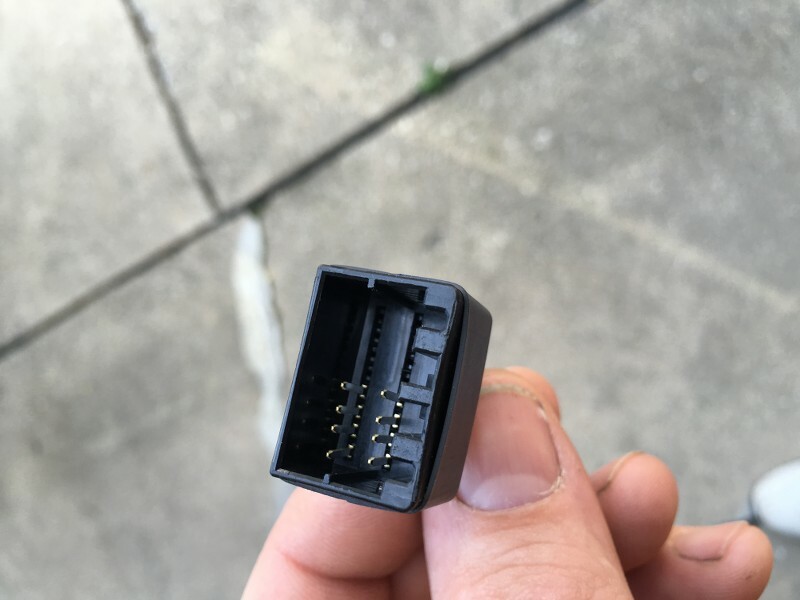 If there was compatible shielded wiring like what was in the 2014-2015's, I'd have probably just used another set of Toyota connectors wired with RCAs to connect it but no point in doing that if it was only going to solve half the problem. Since my car had Starlink, I needed to take the audio coming from the amp to the Starlink control unit and reroute it to the front high speakers (tweeters). I did this by removing the pins I didn't need from a connector housing that was the same as that on the Starlink control unit and then soldered the appropriate remaining pins to one another. I could have omitted this connector, keeping Starlink but that meant extra connectors, wiring and time; all of which would have been for something I didn't care about. The connector is TE P/N 175967-2. The remaining pins were removed. For the backup camera, I built a simple voltage regulator to bring the battery voltage down to 6V and tied that into the ACC wiring harness on the DDX916WS. Connector is Toyota P/N 90980-12365. 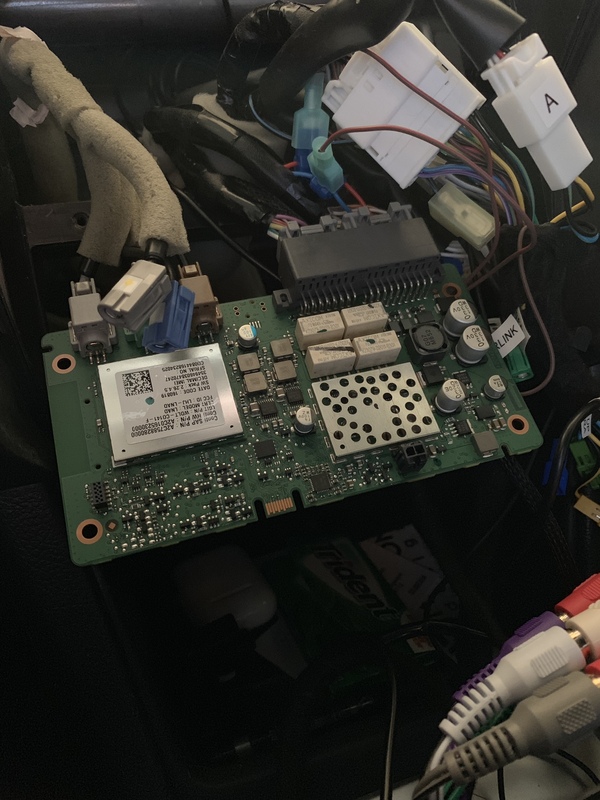 To get the steering wheel control, reverse and parking brake signals, I used the SWC harness that came with the DDX916WS which connected to i87 and added wires on pins 2 and 15. I was thinking about adding the additional wires needed to connect the factory 3.5mm aux input in the center console to the DDX916WS for the sake of completeness but the odds of it ever being used were slim-to-none so I decided it wasn't worth the time messing around with it. Connector is Toyota P/N 90980-12409. The remaining pins were left unpopulated. 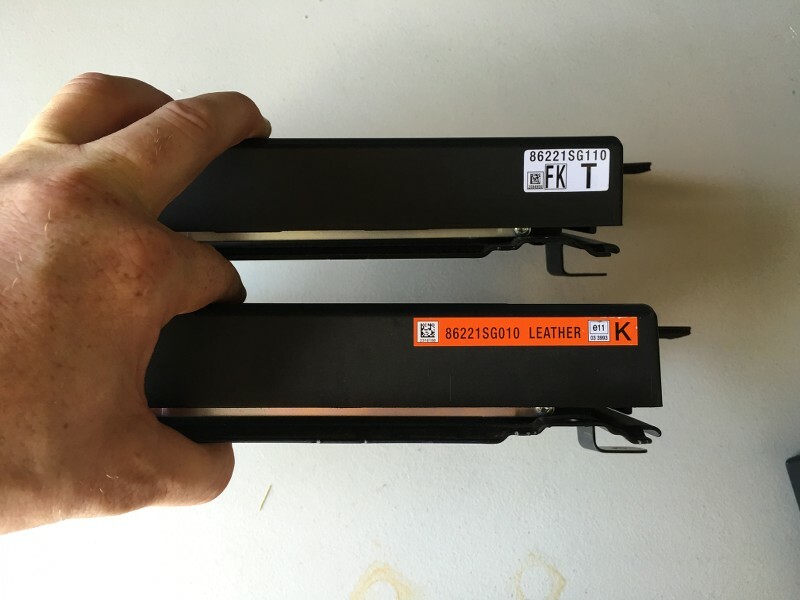 After spending some time researching the H/K amp, I came to the conclusion that it would be price-prohibitive to make something to take the front and rear signals and generate the required data signal needed to tell the amp the fader information it would need. Long story short, I spent some time in the seat of my friend's 2015 Forester with the H/K audio to see if there was any discernible difference I could hear between it and my 2016 to see if using the H/K from a 2014-2015 Forester would be an option and after a couple days back and forth between the two, I found out that the audio quality between the two was indistinguishable to my untrained ears. I also found out that I'd have been hating life if I had purchased anything other than the XT. So I replaced the original H/K amp with one from a 2015. In keeping with the cutting no wires theme and needing a low-level signal for the amp, I picked up a Kicker Z-Series 16.5' RCA cable since it was twisted pair construction and cut it in half with the cut ends down by the newly installed 2015 Forester H/K amp. I made a selective pass-thru harness for the wiring I needed and then on the other end, I inserted the low-level input wiring from the RCA cables. I thought I had taken a picture of this when I still had the seat off but I can't find it on my iPhone so either I was slacking or I deleted it when I was going through some of the other shots I took. If I can sneak a decent one with the seat all the way raised up, I'll add it to this thread. The remaining pins on connector i262 were left unpopulated and the wiring on connectors i263 and R315 was not changed. The install isn't super difficult but it can be complicated if you don't have a lot of experience. 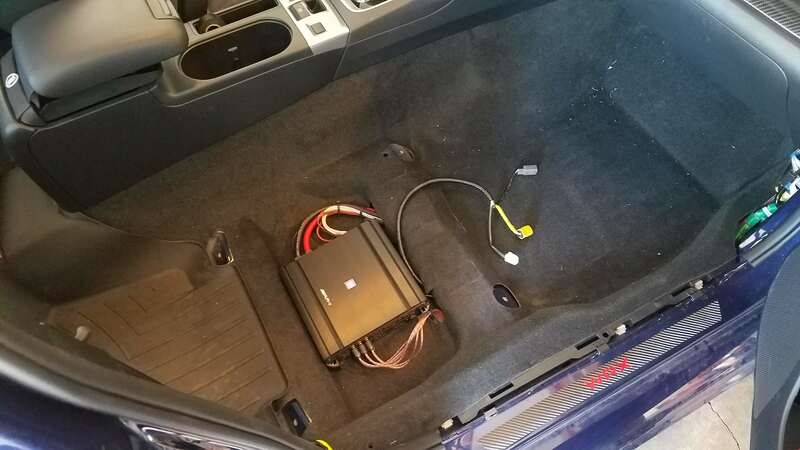 I decided to mount the Amp under my passenger seat and I did tap into the speaker wires coming out of the H/K amp and utilized the current stock speakers. I think they sound fine and I don't see a real need to upgrade them (unless you really want thumping bass, more later on this). I bought a 4 gauge amp wiring kit from the internet and then I also purchased a set of RCA cables (I got one that had 6 connections, or 3 sets of simple RCA cables). You will need at least five RCA connectors (2 for the front speakers, 2 for the rear speakers, and 1 for the sub). I ended up using a simple y adapter to make my 1 sub output from the radio go to both sub inputs on the amp. 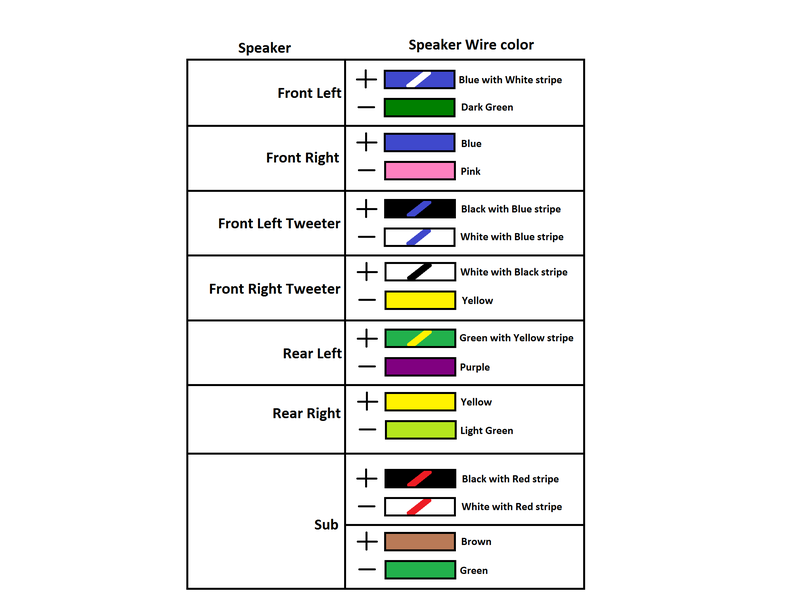 I also bought a ton of speaker wire because I ran all the speaker wire from the new amp to the trunk where my H/K amp is. Here is the basic overview of how ran everything. I used some 3M "strip caulk" to "seal" the hole that I had to make in the rubber grommet. There are other methods for routing the power cable but this seemed to be the safest and cleanest from my perspective. There are several tutorials for this online. 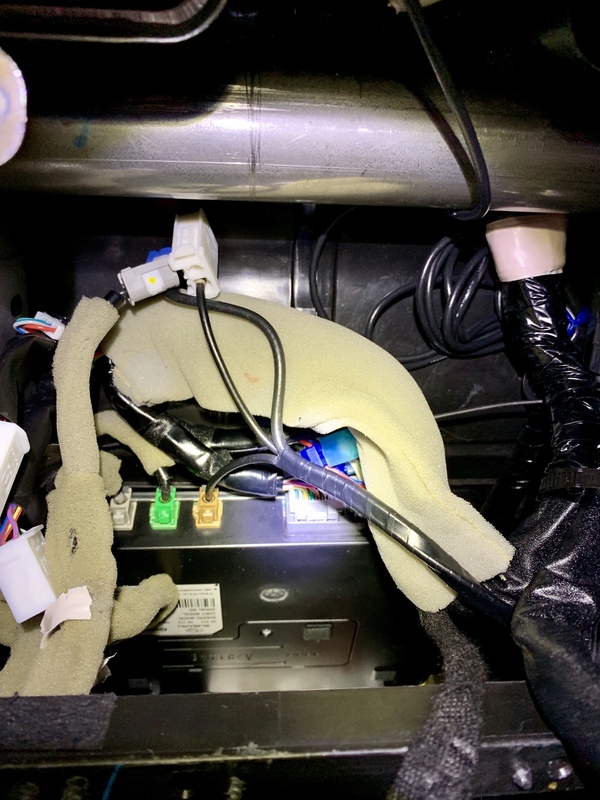 I had to modify (and then close off) the heater vents under the seat so it wouldn't blow hot air on the amp. I found that the carpet is super rigid here so I didn't actually screw the amp down to the underbody of the car but you might consider this if you do any offroading or have rough roads in your area (I might screw mine down later). I grounded the Amp to a ground point that I found under the seat, any clean metal spots would work though as long as it is close to the amp (the closer the better). These wires were in two different harnesses and I didn't grab the pin locations but I can if you need them. 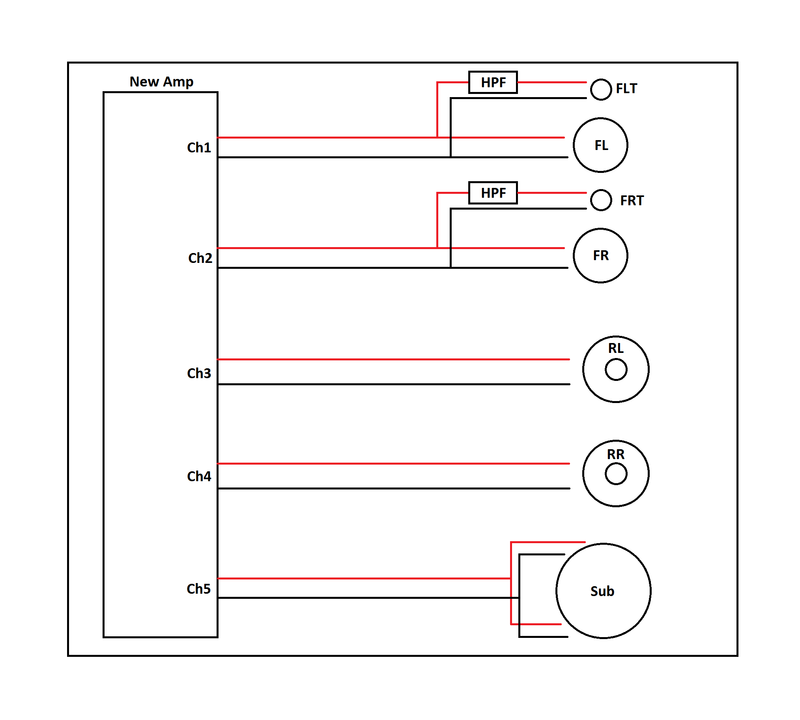 The diagram above doesn't show that I tapped into the H/K wiring but it does show what channel on my amp went to what speaker and how I divided 5 channels among 7 speakers. I also added high pass filters to the tweeters in the front dash. 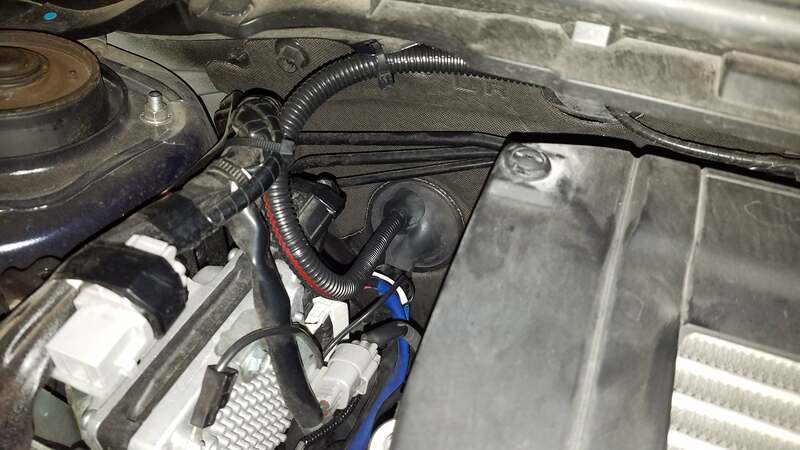 The dash speakers are about 3 inches so I just found a HPF online that was designed for 3 inch speakers and installed it inline with the positive speaker wire when I connected to it in the trunk. 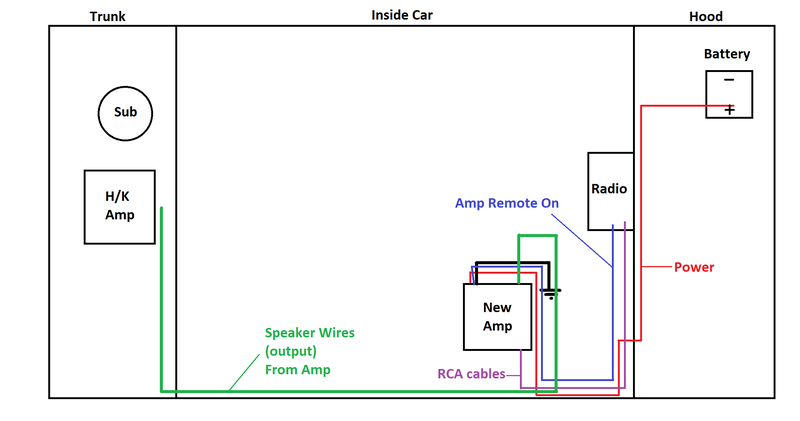 Also, the sub in my car was a dual coil sub so I wired it in parallel. I have the gain pretty low since it is only an 8 inch sub. It will clip pretty hard if you push the gain up on it. If you are looking for significantly more bass then a new subwoofer would probably be a good investment. I used to do this for a living so I was pretty comfortable with the steps involved and it took me most of a day to complete. I would budget several days just to be safe if you aren't real familiar with the process. If you have any further questions feel free to ask. Hey JRCrutc, I just bought the HU from Idoing and everything else I needed. 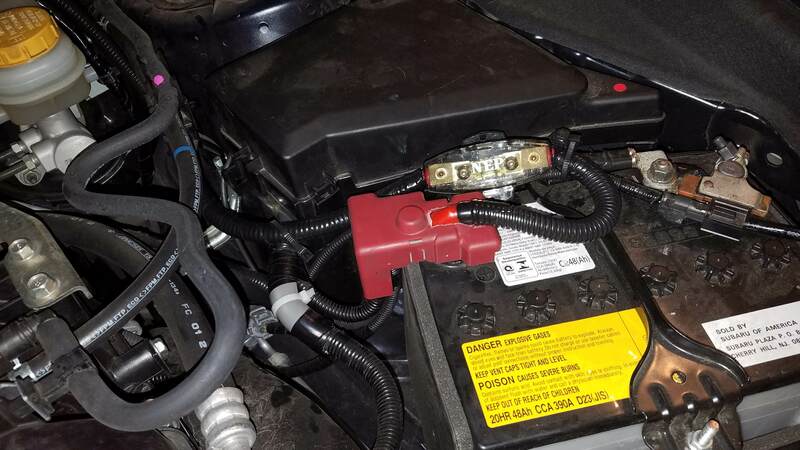 Can you tell me more about how you tapped in to the h/k amp wires and how did you use both of the metra harnesses? I guess what I'm trying to say is I know you disconnect the harnesses from the amp but do you connect the metra ones to the amp? I removed the connectors (plugs) from the amp and then spliced into the wires (I didn't cut them just tapped into them). Then I taped the ends of the plugs with electrical tape and zip tied them up behind the HK amp. There may be aftermarket connectors that fit these plugs but I didn't look for them, it's pretty easy to just tap into the wires. This way the HK amp is completely disconnected and the aftermarket amp is sending all the power to the speakers. Not trying to high jack this thread but this is what I did to my 2017 WRX Limited with 7” touch screen, NAV and HK. I replaced the factory HU to W4400NEX with the iDataLink Maestro and SU2 Harness. Everything went well, then I realized that the front speakers don’t work. I did some research and found out that the front speakers are connected to the telematic unit. So I decided to tear the telematic unit apart and shoved it behind the dash to make it fit behind the dash. I changed my mind. I made some room behind the dash by removing the brackets and bolts that used to hold the factory HU and bending the other parts of the brackets back. That gave me enough space to hide the telematic unit behind the dash with the housing facing down. But somehow, that created another problems. When the OBD2 is plugged in, it triggers all the warning lights on the dash and also the back up camera no longer works. So I decided to not to use the OBD2 port. I don’t mind not having the gauges and what not anyway. Everything works right now except the BUC. If someone can chime in help me out? Update: all my issues has been fixed! Nice! How’d you fix your issues? I’ve read that the new Apple play in the 2019’s is god awful (wanted to swap a ‘19 HU into my ‘18) but now I’m back to looking at aftermarket. Only concern is integrating it because apparently the Harmon Kardon doesn’t play nice w/ aftermarket. Maestro RR will let an aftermarket unit play nice with the HK system. iDataLink RR will retain the HK audio and it's actually sounds so much better than the stock HU. Now everything works like it's supposed to. Also, I wanted to get the Sony XAV 210SXM but it doesn't have wireless Carplay. Having a wireless Carplay is really nice. does it play nice with the 17-18 forester limited HK units? Unknown. Depends on if it has 2 CANBUS's or 1. The 2015-2017 WRXs can use the Maestro RR. 18+s require the RR2 which is still in development. I don't know if the 17 Forester falls into the former or the latter category.